Build It Better! provides up to 10 hours of new KIBO activities based on the Building Brick Extension Set. 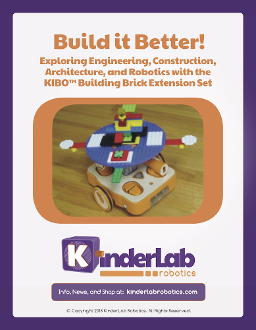 This research-based curriculum booklet supports the KIBO Building Brick Extension Set with engineering and architecture connections. Students will build onto KIBO with LEGO® compatible building bricks to create and program robotic pets; build dream houses; and invent their own solutions to problems in favorite storybooks.